Skopelos food is famous for its delicious appetizers such as the eggplants with yoghurt recipe. It is a perfect introduction to the traditional Skopelos cuisine that aspires to be contemporary and creative while honouring the traditional practices passed on from one generation to the other. Fresh eggplants and homemade yoghurt create a unique, refreshing taste, ideal for those extra warm summer days and nights at the island. Read below our eggplants with yoghurt recipe, another Skopelos food delicacy that will excite you. We clean and peel the eggplants before slicing them. While seasoning them with salt, we place them on a baking tray and sprinkle some thyme. We grill them in medium heat (about 10 minutes) and turn them from time to time so they will be cooked evenly. Meanwhile we in a pan we add olive oil and sauté some onions, slices of garlic, a few tomatoes, sugar, salt and pepper (5 minutes-medium heat). Next pour the sautéed mix on top of the eggplants and bake them for extra 15 minutes in 200C. At the same time we create our signature yoghurt sauce by mixing together Greek yoghurt, garlic, pepper, olive oil and some basil. When the eggplants are ready, we place them in the mixer to make a mushy eggplant mix. 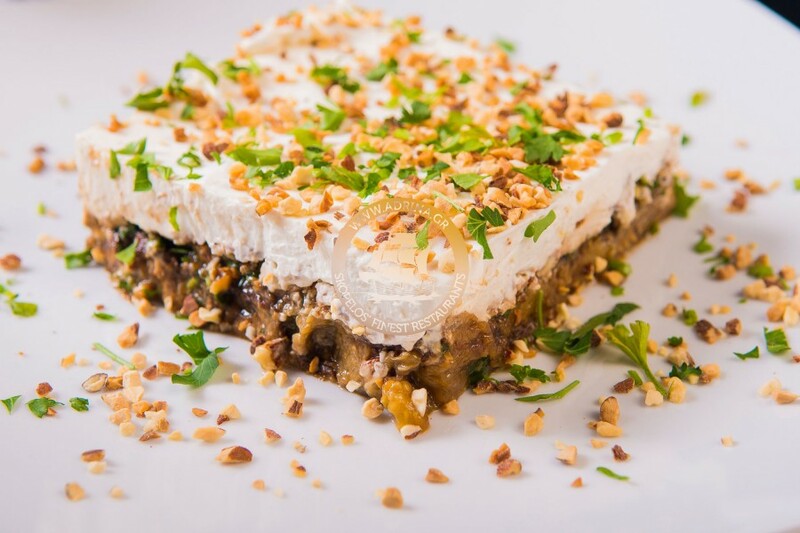 Finally, we place the eggplant mix on a plate, add the yoghurt on top and sprinkle with walnuts. Explore eggplants with yoghurt yourself and you will instantly become a fun of Skopelos food!